Building Homes for Heroes works hard and with a purpose in their charitable efforts. Recently, in honoring the organization's charitable efforts, Building Homes for Heroes Founder and CEO Andy Pujol received the Patriot Award for his selfless dedication to our military service members. The Patriot Award represents the highest civilian honor bestowed by the United States Special Operations Command. 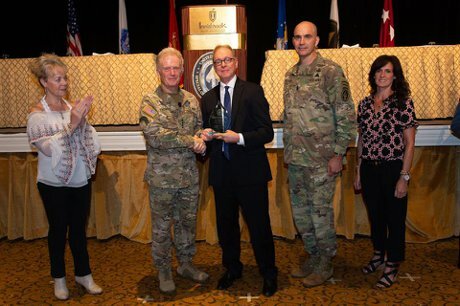 In the photo below, General Raymond A. Thomas III, USA 11th Commander of U.S. Special Ops Command and Command Sergeant Major Patrick L. McCauley, together with their spouses, presented Andy with the Patriot Award.